A couple of weeks ago, one of my best friends from uni got married. While attending Asian/Indian weddings is pretty normal for me, I’m sure not everyone has been so I thought I’d give an insight into it and Indian fashion. Indian weddings are generally very, very elaborate affairs; think 700+ guests, huge venues, elaborate stages and centrepieces and some of the most amazingly colourful, embellished outfits you’ve laid eyes on. As with any other wedding, the best part is getting dressed up…but Indian weddings take this to the extreme. A new outfit will cost hundreds of pounds, but you do get your money’s worth as the outfits are typically very heavily embroidered and made out of sumptuous fabrics like silk. Oh and don’t forget the shoes, bag, (gold) jewellery, bangles and optional trip to the hairdressers or beauticians to get mendhi done! There are three quite broad types of clothing you can wear to a wedding. 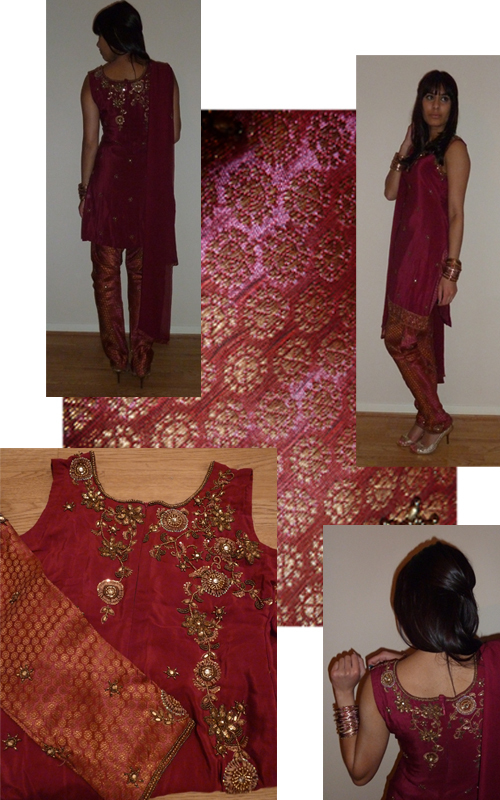 A salwar kameez is the easiest and simplest type of outfit, it consists of a top and trousers. The top will generally be quite fitted and can be full sleeved, short sleeved or sleeveless. The trousers can either be loose fitting which is quite traditional or tight fitted which is a lot more modern and popular. You can also wear a lengha which is a long skirt and a matching top. The skirt is generally the focal point and heavily embroidered. The top can either be as embellished or a bit plainer. 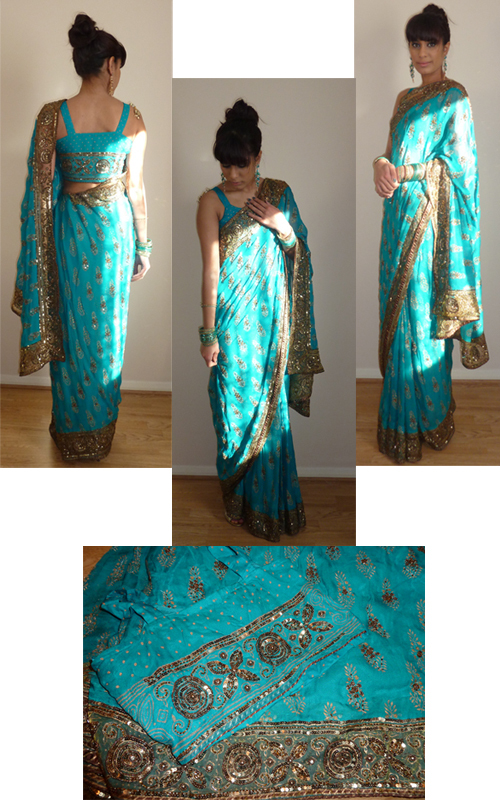 And of course, the third option is the classic sari, which I will describe in a bit more detail later on in the post. I attended two different events for the wedding, the first didn’t require much dressing up so I wore a salwar kameez. I went for fitted trousers which had a gold sheen to them and a plain-ish top with a bit of embroidery on the front and back. This outfit is very understated and compared to others at the event I was pretty under-dressed. That’s ok though, I saved the big guns for the wedding. For the wedding I chose to wear a bright blue sari which was elegantly embroidered but not very bling compared to what other guests wore. To be honest, I’d rather wear something a little bit plainer but sophisticated rather than something overly embroidered and over the top. Sometimes (a little bit) less is more. I think most people are familiar with what a sari looks like, but what you may not know is that it is over 5000 years old! They were mentioned in the Rig Veda which is one of the world’s oldest surviving texts. Saris or draped/wrapped outfits have been depicted in ancient poetry, texts and scriptures across the Asian continent from Tamil poetry and Indian sculptures from the 1st-6thcentury AD. That little factoid blew my mind; it’s amazing to think that a certain way of dressing has existed for so long and essentially remains unchanged. A sari outfit consists of three basic elements – the sari fabric, a petticoat worn underneath and a blouse. The sari fabric is actually a whole piece of unstitched cloth which is draped, pinned and tucked into shape. All of the saris I own are silk and have gorgeous patterns and lots of embellishment on them as I wear them to weddings but they can also be made out of cotton, chiffon and nylon. The petticoat is worn underneath the sari as the fabrics can be quite sheer. The blouse is very short and can be backless, halter-neck, have short sleeves or thin straps. For weddings, they usually have a lot of embellishment and embroidery. There are various styles depending on where you’re from. For the purpose of this post, I’m going will be talking about what I know which is the Punjabi/Indian style where the sari is wrapped around the waist with one end draped over the left shoulder from front to back. Luckily, most saris can be bought ‘ready made’ so you just need to clip it together and wrap it around once. I do have some saris which are just one really long piece of fabric which are a bit of a pain to put on – my mum has to help me get dressed and I slowly spin in a circle as she tucked and pleats the fabric around me. This is a very, very simplistic description of how to do it but I’ve never managed to do this myself, it’s incredibly hard to get one long piece of fabric to look so beautiful! One end of the sari is quite plain and the opposite end is very elaborately embroidered, the plain end needs to be tucked into the waistband of the petticoat and the rest needs to be wrapped around the lower body once. Then the fabric needs to be hand-gathered into even pleats and tucked into the waistband, although this sounds simple enough it’s pretty much an art form to get the pleats the right size, using the right amount of fabric and leaving enough fabric free to finish the rest. The fabric then needs to be wrapped around and the body and finally draped over the left shoulder with the intricately embroidered end hanging from the back of the shoulder. Here’s my sari which took about 10 minutes to put on as it was ready made. Sorry for the random streak of sunshine, hopefully it helps you see the colours better! If your outfits are really understated I can't imagine how sparkly the rest of the guests must have been! You look lovely in both outfits, you can really pull off colour. I was taught how to put on a sari once and totally couldn't get the hang of the pleats at all, so difficult! Oh wow, you look gorgeous Reena! I had a peak at your album on fb and it looks amazing. So much sparkle and bright colour, I love it all!